SRIHARIKOTA, INDIA, May 23, 2016 — Indian Space Research Organization (IRSO) successfully flight tested India’s first winged body aerospace vehicle operating in hypersonic flight regime. 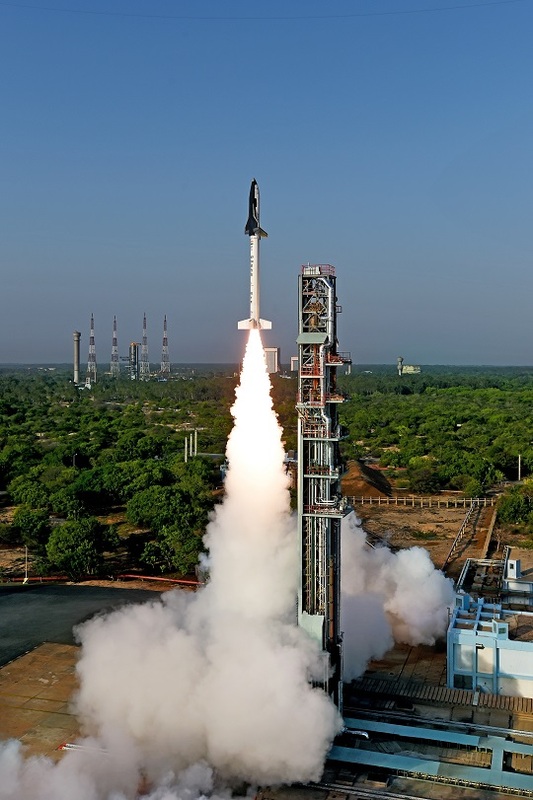 In this experimental mission, the HS9 solid rocket booster carrying the Reusable Launch Vehicle – Technology Demonstrator (RLV-TD) lifted off from the First Launch Pad at Satish Dhawan Space Center, Sriharikota at 07:00hr IST. After a successful flight of 91.1 second, HS9 burn out occurred and the HS9 with the RLV-TD mounted on top coasted to a height of about 56 km. At that height, RLV-TD separated from HS9 booster and further ascended to a height of about 65km. From that peak altitude of 65 km, RLV-TD began its descent followed by atmospheric re-entry at around Mach 5 (five times the speed of sound). The vehicle’s Navigation, Guidance and Control system accurately steered the vehicle during this phase for safe descent. After successfully surviving a high temperatures re-entry with the help of its Thermal Protection System (TPS), RLV-TD successfully glided down to the planned landing site over Bay of Bengal, at a distance of about 450km from Sriharikota, thereby fulfilling its mission objectives. The vehicle was successfully tracked during its flight from ground stations at Sriharikota and a ship borne terminal. Total flight duration from launch to landing of this mission of the delta winged RLV-TD, lasted for about 770 seconds. In this flight, critical technologies such as autonomous navigation, guidance & control, reusable thermal protection system, and re-entry mission management have been successfully validated. ISRO acknowledges the support of Indian Coast Guard and National Institute of Ocean Technology (NIOT) for the mid sea wind measurement and ship borne telemetry respectively in this mission.